Iranian President Hassan Rouhani has lashed out at the UN Security Council for its failure to stop Israel’s atrocities in the besieged Gaza Strip. Addressing the ministerial meeting of the Palestine Committee of the Non-Aligned Movement (NAM) in Tehran on Monday, Rouhani said “the continuation of the UN Security Council’s indifference and inaction” has emboldened the Tel Aviv regime to continue its crimes against the oppressed Palestinian people in Gaza. “The inaction and flagrant indifference of the UN Security Council toward the current catastrophe in Palestine, particularly in Gaza, is a blatant symbol of injustice in the Security Council,” said Rouhani. He said effective measures have to be adopted to put an end to such crimes because Tel Aviv is violating human principles. Rouhani, the rotating president of the NAM, further called on the movement to roll up its sleeves to put an end to Israeli “war crimes and genocide” in the coastal sliver. NAM, based on its fundamental standards, should take action to stop the current trend of war crimes and genocide committed by the Zionist regime, said Rouhani. 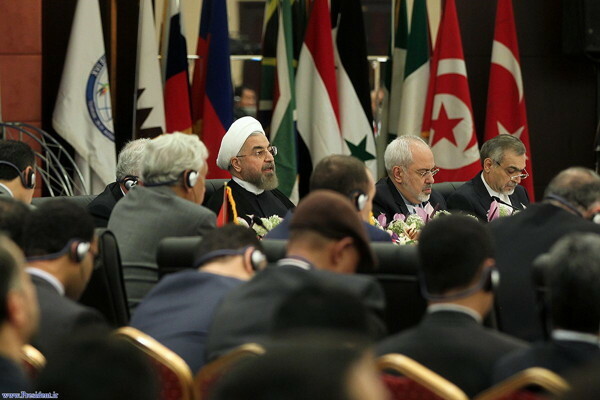 “The Non-Aligned Movement, as an international circle with ample potential and capacities, can and should take basic and firm steps toward the realization of real peace and social justice in line with the inalienable rights of the oppressed Palestinian people,” said the Iranian president. Rouhani further said the crisis in Gaza would not be resolved without the return of Palestinians to their homes. Following Rouhani’s speech, Palestinian Foreign Minister Riyad al-Malki said the humanitarian situation in Gaza is at breaking point and people are experiencing unspeakable horrors. He called for an arms embargo on Israel, which, he said, uses military equipment against defenseless Palestinians. Over 1,820 Palestinians have so far been killed and some 9,400 others injured since the Israeli military first launched its offensive against the Gaza Strip on July 8. The Israeli military says three Israeli civilians and 64 soldiers have been killed in the conflict, but Palestinian resistance movement Hamas puts the fatalities at more than 150.